Who's got the button? The elusive search for four matching pairs for some puppy eyes. Really funny to watch the quilters flock over to that table when they heard a button tin being emptied! Weeks 24, 25, 26, I am half way!!! Never been a big fan of machine quilting gloves, but I think I have found the ones! Just love these, really comfortable and good tactile use as well. Much to my delight, spring has sprung here in the north and we have lost a considerable amount of our snow pack! The south side where all the driveway snow got thrown, pile is down by a good two feet! and sunshine, how I love the return of sunshine!!! 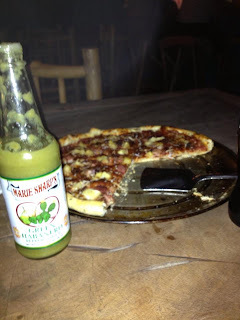 Another Belize pic, of one of my favourite things there, Hawaiian pizza, with FRESH pineapple and toasted coconut. Ate it three times while we were there. Every meal we ate there was accompanied by Marie Sharpe's hot sauce, in a variety of flavours. "I the Messiah did not come to be served, but to serve." Happy and Blessed Easter everyone! Hope you and Bruce have a wonderful Easter as well! Hmm...no one around here puts coconut on Hawaiian pizza but it makes sense. I'll have to try it...after I try that coconut bread recipe I found last week tho. BTW - I would have been right there fawning over the buttons!